For a long time, not much progress has been made (or at least publicly known) on the 1800s trade card issue called the Pink and Blue trade cards and catalogued by Frank Keetz in his book, “Baseball Advertising Trade Cards 3rd Edition,” as H804-34. The set had been known to include three cards, though Keetz himself said there could be more. No more had ever been widely accounted for so the understood checklist remained at three with not much new news. But I’ve had a few breakthroughs on the set in the past couple of months. 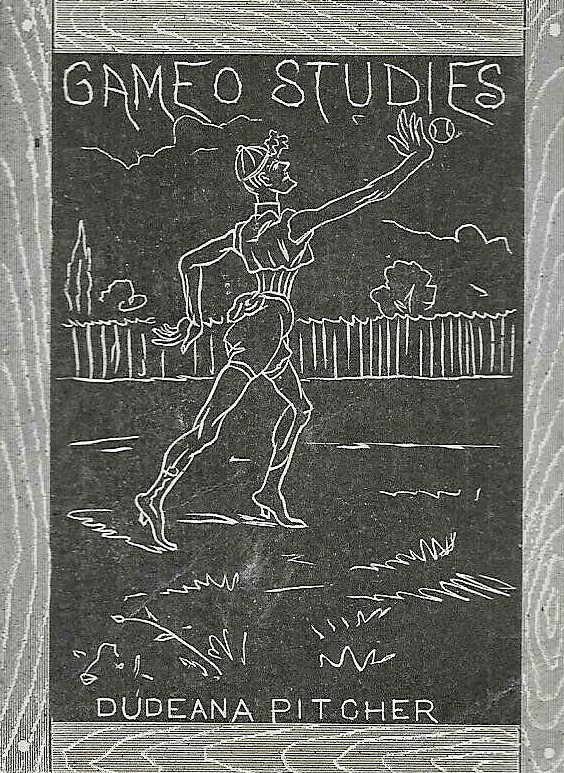 First, back in December 2017, I found the pose for these cards used on a Liebig trade card issue. Liebig was a meat extract company that was quite fond of trade cards, distributing a ton of them. 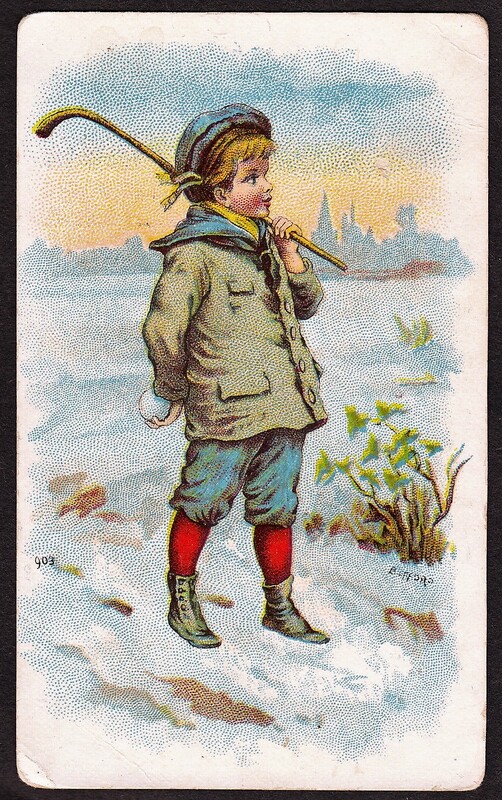 The cards used the same boy and pose, but were lacking the trademark pink and blue colors and also depicted the boy with a sword instead of a baseball bat. And most recently, I uncovered a fourth checklisted card in the set. The tl;dr here (if you refuse to read my full writeup on them) is that this was a set of trade cards distributed by Poor Man’s Dyes sometime in the late 1800s. Their name is on the fronts of them and a distributor/vendor name is stamped as well as their location (city and state) to let consumers know where the product could be purchased. The cards were named the ‘Pink and Blue’ set by Keetz because, well, they’re pink and blue. Each of the three known cards featured a boy with a baseball bat and in two of them, he was being beaten with a broom by an unknown person. The cards aren’t entirely rare but aren’t too easy to find, either. They pop up on eBay on occasion and you’ll occasionally spot them from dealers with decent trade card inventories. But few collectors know their Keetz designation of H804-34 so they often go under the radar. They aren’t scarce but they aren’t nearly as common as many other trade issues. Three cards were known in the set but Keetz admitted in his book that there could be more. I can say now that there’s at least one more. I recently came upon a completely unchecklisted card in the set, knocking the checklist up to four. This card is quite different from the others and helps explain quite a bit. First, we see the boy’s antagonist for the first time – an older woman. Second, the boy has changed the situation, standing on top of of the woman with not only the bat, but the broom she was hitting him with. The card is clearly part of the pink and blue set as it’s the same child with the same outfit, and the bat and broom are the same. Most importantly, it features the same light pink and blue colors found on the other cards. And, obviously, the Poor Man’s Dyes name and layout at the top helps identify them. The new find also helps tell the story of what exactly was going on. The story, if there was one, was fuzzy based on only the three cards that were known. The fourth, however, provides a more complete picture. Based on the two cards showing the boy being hit with the broom, those appear to be the first two images in the set. In what order, no one could tell. But the story begins with the boy beating hit with the broom in those two cards. The third card would seem to be the one here the boy is rolling up his sleeves. We could never tell what was happening in this card but we now know from the fourth card that he appears to be readying himself to fight back. The fourth card is the new, unchecklisted issue, showing the boy victorious in conquering the adult. All four cards from my set are presented below in a hypothetical order. Could there be more cards in the set? It’s certainly a possibility. But the set could also now reasonably be complete at four cards. A fifth card, if one existed, could possibly show the boy taking control of the broom. But again, with this new card, we’ve got a more complete story and that could leave the checklist at four.